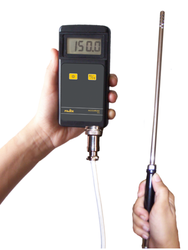 - Radix Handheld thermometers are small, portable devices for quick and effortless measurements. We have at our disposal a vast gamut of Hand Thermometers, which is highly appreciated by the clients, owing to its superior functionality and accurate results. These prove helpful in measuring the body temperature as well as the temperatures of machines and liquids. We offer these to the clients at highly economical prices. The Raytek® Raynger 3i Plus high temperature handheld infrared thermometer is designed to meet process performance requirements in many industrial applications, including highly demanding hot environments in primary and secondary metal processing, as well as petrochemical and power plant operations. Made available by us is a commendable range of Handheld Laser Thermometer. Widely used at different places, the offered product is available in different models and other related specifications. In addition to this, our provided product is rigorously tested by quality controllers to ensure its reliable performance. Hand held digital thermometer / battery operated temperature indicators. Metrix 900 x L Professional Digital Thermometer for use with any K-type thermocouple as temperature sensor. Temperature indication follows National Bureau of Standards and IEC584 temperature / voltage tables for K-type thermocouples.